Westerville, OH, February 23, 2017 – A vibrant new, affordable senior community is coming to Circleville, OH. Construction is now underway at the former Everts Middle School where 49 new rental apartment homes are being developed for independent seniors on fixed incomes. The new apartment community, located near the heart of Circleville’s downtown district, will also include a community garden and greenhouse, a cafe open to residents and the public, plus many other valuable onsite services geared for seniors. The Woda Group, Inc., a leading development firm in affordable housing and adaptive reuse, has combined efforts and talents with nonprofit Pickaway Community Action Organization (PICCA) to create the new community to be called Everts Hill. The development is being carefully planned to address the needs and wants of seniors while honoring a historic cornerstone in the community. The primary source of funding for Everts Hill was made possible through the allocation of state housing and federal tax credits. 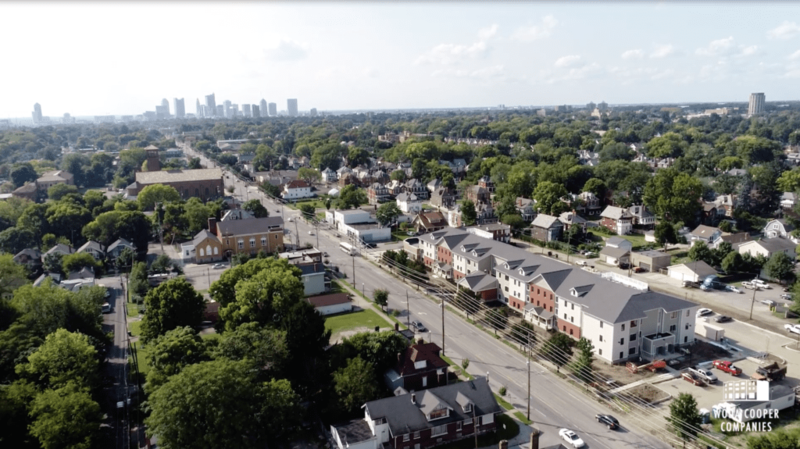 The Ohio Housing Finance Agency allocated $910,400 in state housing tax credits; the Ohio Capital Corporation for Housing (OCCH) is investing $9.1 million in equity in exchange for those credits. OCCH is also investing $2.2 million in exchange for federal historic rehabilitation tax credits. Had it not been for Woda’s and PICCA’s efforts, plus the foresight of the City of Circleville, the 1916 school building would have been demolished last year. “Circleville community leaders were extremely committed to preserve the academic portion of Everts Middle School because they see the property as an important local symbol of community pride and history,” said Michael Krause, Vice President of Development for Woda. The new Everts Hill complex will maintain the charm of the vintage school building while offering modern design and contemporary features in the one- and two-bedroom units, said Krause. The exterior of the building will largely retain its existing character, with no alteration or addition to the facades or vintage architectural features. The interior will feature salvaged panel solid wood doors, original repurposed wood moldings, retained slate blackboards, wood windows and commemorative artwork in common areas. The apartment units will occupy what were former classrooms, libraries, and performance areas. All units at Everts Hill will be 100 percent compatible with universal design, with many units offering full ADA accessibility. The facility is also projected to earn Enterprise Green Communities Certification which, Krause said, means it will cost less to operate and maintain, use fewer natural resources, generate less waste and contain fewer toxic materials, versus standard rental home developments. Apartment units will feature energy-saving windows and come equipped with energy- saving systems and appliances. Partner PICCA will maintain offices and have case managers on-site to coordinate support services such as transportation, meal delivery, health and wellness programs, budgeting classes and other services benefiting seniors. Perhaps the most extraordinary features at Everts Hill will be the community garden/greenhouse, managed apiary and new garden-to-table cafe that will be part of the new complex. These features will enrich the quality of life for residents and the community at large, Krause said. Woda and PICCA enlisted support from Ohio State Extension, Ohio Master Gardener Volunteers and Rhoads Garden Center, to develop the extensive community garden and greenhouse in what was formerly the football field behind the school. The Scioto Valley Beekeepers will assist to develop a managed apiary for honey production at the center. The garden complex will lend apartment residents, and others in the neighborhood, an opportunity to try their hands at gardening and bee keeping. The local Stoneridge FFA Chapter will also assist with operations. In addition, onsite classes on gardening and healthy eating will be offered. Garden produce and honey from the site will be used in an all-new commercial kitchen to inhabit the school’s former cafeteria area. Connie’s Country Cafe, an established area restaurant, will manage the kitchen/cafe to provide a healthy, flavorful breakfast and lunch option for residents and the local community. It will also create employment opportunities for residents and cater meals for a neighboring Head Start program. In addition, the cafe will offer certificate training in restaurant management through Ohio State University. The City of Circleville donated all of the kitchen equipment to the project, valued at $125,000. “The adapted Everts Hill community will be both a wonderful place for senior residents to call home, and a true asset of the Circleville community,” said Krause. Expected completion for the development is early 2018.